So let's look at some general, straight foward info on stocks; here's why you'll usually see them in people's financial portfolios, and why having them as your sole source of investment may not always work out favorably. What the heck are stocks, anyway? Simply put, when you buy a share of a company's stock, you are buying a piece of ownership of a company. No, this does not give you the right to go into the company and play Donald Trump (who hasn't entertained the thought of uttering those now famous words "you're fired" to someone?). It simply means your moolah has bought a small piece of the company. In turn, the company hopes there will be a lot of people like you wanting to buy into them, as your money (and other share holders) will ultimately serve to give them working capital. Sure, but how does it work? With that being said, the stocks that you buy from a company can fluctuate depending on how the company is doing. 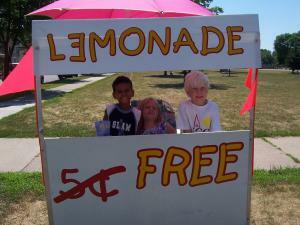 Say your kiddo runs a summertime lemonade stand. You buy into his company, purchasing one stock at one dollar. It's a blistering hot summer, people are thirsty, and your little business entrepreneur rakes in the dough. By the end of the summer, your share bought at one dollar is now worth three dollars. You've just made some profit on your one dollar investment -- all because your rugrat juiced lemons and hawked his wares all summer. OK, great! Why would you not want to solely invest in stocks? Because not all businesses are as successful as your child's lemonade stand, that's why. Fast forward to the next summer. Your son is raring to take another stab at the stand business, and, remembering last summer's success, you're more than eager to grab some more of the block's hot stock. The summer turns out to be one of those dismal ones that really can't be described as summer. It rains a lot, is unseasonably cool, and most of the neighborhood has decided this is the summer to hightail it out of town for vacation. Nobody wants lemonade. You can see where this is going, right? Profits dwindle, the stand struggles and the end result is that your share has lost considerable worth. The conventional wisdom is that stocks give the best return over the long-haul, but are the most volatile. Thus most people tend to buy more stocks when they're younger and reduce that amount as they get closer to retirement. The bottom line is: be aware and educated about the basics of stocks before putting your hard-earned money into them. Can you make money? Sure. But you can also end up taking a loss. You can learn more about stocks and what role they should play in your portfolio in our Right Questions to Ask About Stocks series. This post appears in the Carnival of Personal Finance. Be sure to head over there to check out more great personal finance posts. Definitely a no frills guide to how stocks work! Nothing wrong with keeping it simple, sometimes people overcomplicate things far more than they should. Hi Shaun. I agree with my whole heart. That's my motto: keep it simple, because sometimes simple is hard enough! Thanks for sopping by!